Although Mathilde Felixovna Kschessinskaya’s title - "S.A.S. La Princesse Romanovsky-Krassinsky, Prima Ballerina du Théâtre Impérial de St Petersbourg" might lead one to imagine that she was a monument of egocentrism, what one discovers is a larger-than-life individual, as enchanting in life as on stage, and who in art, was penetrated with the greatest integrity. 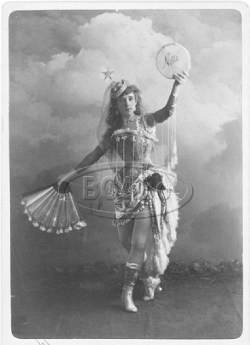 Mathilde Kschessinskaya came by it rightly, for both her parents – soon followed by her elder brother and sister – were professional dancers. Her father Félix, an exceptional artist glittering with decorations, continued to appear on stage until the age of 83! Born in 1872 to a family of Polish noblemen, Kschessinskaya took her first dancing lessons at the age of three. Her innate ability was soon to flourish within the Imperial School. In her Memoirs, she recounts how naughty and lively she was in class – although nonetheless attentive and hard-working. Her first teacher was Lev Ivanov, who would accompany class to his violin. At the age of eleven, Kschessinskaya entered the class of Ekaterina Vazem, where more complex exercises were the order of the day, as was grace, and mastery of every fundamental step. Vazem insisted on turnout, and on a correct position of the foot on pointe. Her class was the stepping-stone to that of Christian Johansson (1817-1903), a school of virtuosity. Thus, at the age of fifteen, Mathilde Kschessinskaya entered the class of Christian Johansson, whom she celebrates in her memoirs as a most excellent teacher, a poet in art, a great artist and an inspired creator. Throughout her life, she cherished the memory of one to whom she owed so much. The Swedish ballerina Ellen Rasch - now over ninety years of age - born to a Russian mother and Swedish father, was used to travel to Paris to study, and happened to attend on Kschessinskaya’s studio to take class. The Princess cried: "Sweden! The country of my beloved techer Christian Johansson !". As for Olga Preobrajenskaya, she insisted upon teaching Ellen without charge, in honour of Christian Johansson. Christian Johansson’s contribution to the Imperial Ballet at Saint-Petersburg was of major importance. He had studied at the Royal Opera at Stockholm, where the French had had great influence in the 18th Century, notably through Louis Gallodier under the reign of Gustav III. That King had made of Stockholm an international cynosure, flocked with the outstanding artists of the day. Thanks to Sophie Daguin and André Isidore Carey (a pupil of Auguste Vestris), the French left their mark, as did of course the Italians, through Filippo Taglioni. Before leaving to take up a solo engagement at Saint-Petersburg, Johansson went to Copenhagen to study with August Bournonville. Kschessinskaya has written of her master: "He thought, he observed, and his pertinent remarks were extraordinarily useful to us. His art was noble because it was simple and it was sincere, like the man himself. Every gesture was clothed with meaning and conveyed an idea ... In very large measure, my career I owe to him." 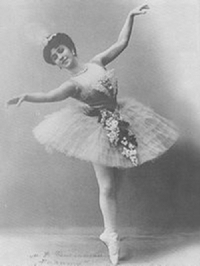 Kchessinskaya drew inspiration from another artist as well: the Italian ballerina Virginia Zucchi (1849-1930), who had been a student, first of Carlo Blasis and then of the latter’s disciple Giovanni Lepri. Although the Italian guests at Saint-Petersburg were, in the main, celebrated for flamboyant technique, Zucchi was an absolute master of pantomime gesture as well. Kschessinskaya wrote of her, "I saw that technique, far from being an end in and of itself, was but a means! ... In Zucchi, the movements, the swaying arms, the back, all were astonishingly expressive". To the teenaged Kschessinskaya, Virginia Zucchi’s art proved a revelation. The praise heaped on the grace, harmony of gesture and keen dramatic sense of Mathilde Kschessinskaya seem to indicate that she was amongst the few who have succeeded in that difficult art of placing body and soul together at the service of theatrical action. A Russian critic summed up her long career thusly: "Having learnt from the Italian school, virtuosity and from the French, grace, Mlle Kschessinskaya has let those rays pass through the prism of a gentle, Russian soul; to which she adds the most enchanting pantomime gesture, thus perfecting, in every telling detail, an art that has delighted the balletomane for twenty years now." The Soviet Revolution forced her into exile. At Paris, where Kchessinskaya finally set up house with her family, her studio was inaugurated on 26th March 1929. Her first pupil, a joy in her life, was Tania Lipkovska. Amongst her disciples were the dancers David Lichine and Tatiana Riaboutchinska. Here, Kschessinskaya was to develop the most unexpected gifts as a pedagogue, developing in her pupils both technique and a personal sense of beauty. In classroom exercises, room was always left for grace and charm, that each individual temperament might best flourish. Great attention was given to the port de tête and épaulement, jewels in the crown of artistic expression. Beryl Morina, who is here with us today, was Mathilde Kschessinskaya’s pupil, and has perpetuated and confirmed her master’s work. Rather than applying a system, Mathilde Kschessinskaya’s approach was to adapt all teaching to the individual. Mathilde Kschessinskaya lived to the great old age of 99.